One of the most important results of this event was the establishment of NASA on 1 October 1958. Glennan headed NASA from its inception until the [x] change of presidential administrations in 1961. During this period he oversaw the definition of U.S. policies for operations in space, contributed to the development of goals and programs to further those policies, and consolidated the resources needed to carry them out. In the process he set the stage for both NASA's future accomplishments and its failures, established most of the methodologies and many of the strategies employed in America's exploration of space, and created the infrastructure that still supports NASA's space efforts. [xi] Immediately after graduation in June 1927, Glennan hitched his fortunes to a rapidly expanding technology, the "talkie" motion picture industry. In one way or another he was connected to the film industry for the next 14 years. Most of that time he worked for Electrical Research Products, Inc. (ERPI), a subsidiary of Western Electric Co., which installed sound motion picture recording and reproducing equipment in theaters all over the world. His first installation was in an elegant Philadelphia theater, but after a year he was transferred to Great Britain where he served as the regional installation manager for Western Electric Company, Ltd. (WECO). In this position, Glennan had a staff of 85 engineers and technicians from the United States and another 200 British employees. As a 23-year-old, he was in his first management position, and he found he had both a taste and a talent for the administration of complex technical organizations. Even as the worldwide depression was deepening in early 1930, Glennan was assistant manager for continental WECO, setting up and running installations and services operations with about 1,000 employees in ten countries of the British Commonwealth and on the continent of Europe. He finally returned to the United States in March 1930 to head a succession of ERPI offices in New York City. Among them, significantly for his later career, Glennan served as assistant manager of the ERPI educational picture project, which produced educational films on science. He also managed the Audio Cinema (originally the Edison studio in the Bronx), when ERPI took it over on default during the depths of the depression. This was his introduction to commercial motion picture production, which he was involved in throughout the rest of the decade. Based on what he found in this survey Glennan identified needs, prioritized initiatives, and set out on an expansion of Case's plant, program, and people. This program became a huge success and Glennan followed it with other fund-raising efforts to finance CIT's rapid post-war expansion. At the same time that Glennan was heading CIT in the late 1940s, he continued to take a strong interest in public service activities. In addition to a number of significant privately-organized civic activities in the Cleveland area, he was intensely interested in what was happening on the national scene. A moderate in politics who supported both Democratic and Republican candidates depending on the issues, he usually took a conservative stance toward larger questions of national importance. Two became immediately apparent during his early years at Case. First, he was an ardent "cold warrior," distrusting Stalin's Soviet regime and debating with others the propriety of the U.S. president treating the Russian leader the same way that he dealt with other heads of state. He also spoke up for the forceful prosecution of the war in Korea. "The lesson we are learning" in Korea, he confided to Rufus Day, a Cleveland community leader, in 1951, "is a costly one but I am hopeful that the results will be such as to make this nation so strong that attack by others is unthinkable. I am afraid that I am not at all optimistic about our ability to avoid war even though it may be delayed. "17 He advocated building a formidable defense capability and constructing a powerful nuclear deterrent force as the best hopes for ensuring the nation's peace. [xvi] Glennan also believed that it was the responsibility of the private sector to take the lead in a variety of areas, rather than abdicating responsibility and allowing government to fill the vacuum. One of those areas was the development of science and technology, perhaps a particularly appropriate area of concern for Glennan because of his background and position at Case. He told the president of a scientific research-oriented corporation in 1952, for instance, that "unless industry moves much farther and faster along the road of social responsibility (much fine progress has been made to date), I am inclined to believe that the omnipresent politician and big government man will step in with costly promises. "19 In concert with this position, Glennan deplored what he called the expansion of the "welfare state," and argued for a strong showing among private institutions so that government leaders would not feel compelled to get involved in too many aspects of people's lives.20 Accordingly, he expressed well the apparent attitudes of many white middle-class, slightly conservative Americans who went to the polls in 1952 and elected Republican candidate Dwight D. Eisenhower as president. Both of these guiding beliefs in Glennan's life helped to shape his actions and contributed fundamentally to the direction he charted for NASA as its first administrator. During the time that Glennan was at AEC, he was officially on a leave of absence from the presidency of Case Institute of Technology. Acting in his stead during those two years was Elmer Hutchinson, a CIT alumnus and an old Glennan associate from World War II. Glennan, never one to sit and vegetate, continued to assist Hutchinson in managing the affairs of Case. He often spent his weekends in Cleveland, especially early in his AEC tenure since his family remained behind to allow his children to remain in their schools. Whenever he did so, Glennan typically spent some time with Hutchinson discussing CIT business, usually answering questions about fund-raising strategies and plans underway. During the years between the conclusion of his AEC service in 1952 and his acceptance of the NASA administrator's post in 1958 Glennan continued his expansion program at Case Institute of Technology and dabbled in public policy issues. In the later arena, he participated in several government committees and task forces relative to higher education and to nuclear power. In 1955 he began serving on a committee under the direction of a Joint Committee of Congress on Atomic Energy, and helped to prepare a study on "The Impact of the Peaceful Uses of Atomic Energy." While on this committee Glennan developed additional associations with members of Congress, among them Senate wheelhorse and science and technology benefactor, Clinton P. Anderson (Democrat-New Mexico).25 He also provided advice to Lewis Strauss, by that time back as chair of the Atomic Energy Commission, on policy direction and energy for peaceful purposes.26 He was appointed to the board of the National Science Foundation in 1956. He joined with several other college and university presidents in an 18-day visit to the Soviet Union to study the educational programs of the USSR under the sponsorship of the Scaife Foundation in 1958.27 Because of this sort of activity, when the Eisenhower administration sought a person to head up the newly created NASA, Glennan was quite well known in business, higher education, science and technology, and public service circles. It was a shock, creating the illusion of a technological gap and providing the impetus for a variety of remedial actions. [xxiv] In the course of the diary, Glennan narrates among other things the history of the Mercury program and its astronaut corps.42 The diary reveals how clearly Glennan understood the tenor of the cold war atmosphere of the latter 1950s and the seemingly life-and-death struggle between the two superpowers. He believed that Project Mercury was more a means to an end than something to be done because it would yield important scientific results. "I came to realize," he recalled in 1990, "that we wouldn't have a program at all if we didn't have one that was exciting to people. That was the reason for manned space flight. But I was interested in what the law required us to do for the benefit of all mankind. And I think that what has been done without man is much more for the benefit of mankind than all we did in getting ahead of the Russians [with human spaceflight]. "43 As a result he fashioned a program that incorporated a healthy human spaceflight element with a solid space science and applications base. In this, he had the strong support of Dryden. 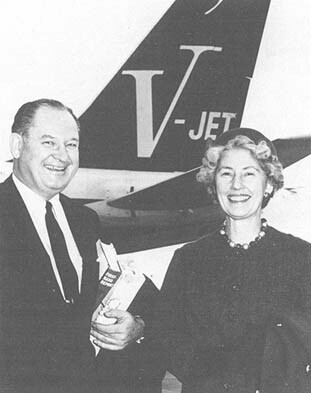 T. Keith and Ruth Glennan in Sydney, Australia, m 1961 for a meeting of the International Air Transport Association, where Dr. Glennan discussed the future of supersonic transports (SSTs). NASA had been active with the FAA and the DOD in developing the concept of am SST in its early stages. In the background is the Quantas Vjet on which the Glennans arrived. [xxvi] From his seat at Case Institute of Technology Glennan watched the activities at NASA during the Kennedy administration with great interest. For a time Kennedy seemed quite happy to allow NASA to execute Project Mercury at a deliberate pace, but that changed in April 1961 because of two important events. On 12 April Soviet Cosmonaut Yuri Gagarin became the first human in space with a one-orbit mission aboard the spacecraft Vostok 1. The effort to place a human in space before the Soviet Union did so had now failed. Glennan wrote a letter to Robert Gilruth, the head of NASA's Space Task Group, offering consolation. "Even though we all expected the Russians to get there . . . first," he commented, "I am sure that each of us had a fervent hope that Mercury would make the grade in time." Even so, he urged Gilruth "not, under any circumstances, [to] deviate from the path you have chosen. There is now even greater reason for applying your engineering judgment to all phases of the project. . . . Keep your chin up! "47 Within a few days, the aborted invasion of Cuba at the Bay of Pigs heaped international censure on the U.S.
Glennan's reaction was immediate. He began corresponding with several people who had been members of the Eisenhower administration, including Ike himself, and expressed misgivings about the commitment to race the Soviets.49 For instance he told Eisenhower, then in retirement at Gettysburg, Pennsylvania, that "this is a very bad move - that we are entering into a competition which will be [xxvii] exceedingly costly and which will take up an increasingly large share of that small portion of the nation's budget which might be called controllable. "50 Glennan harped on this concern throughout the rest of the year, never quite able to accept the view of the Kennedy administration that large expenditures for science and technology in the form of a race to the moon against the Soviets could have much positive benefit for the nation. Four former NASA administrators at Pad 39 of Kennedy Space Center on 10 April 1981 as they awaited the lift-off of the first space shuttle. 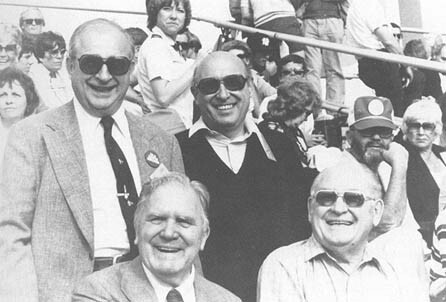 In order clockwise from the upper left of the photo are Thomas O. Paine (1969-1970), Robert A. Frosch (1977-1981), T. Keith Glennan (1958-1961), and James E. Webb (1961-1968), The shuttle flight had to be scrubbed that day, but two days later Columbia did lift off for the first space transportation mission, which ended on 14 April with the first landing of an airplane-like craft from orbit for reuse. The photo was taken by James J. Harford, then the executive secretary of the American institute of Aeronautics and Astronautics. I have no doubt at all as to the desirability and inevitability of manned flight to the moon. And I would accept - not willingly - a national decision to beat the Russians to the moon if such a decision resulted in a truly "crash" program with no effort spared or held back. No one knows the intentions of the Soviet Union but all of us understand the ability they have to dedicate [xxviii] men and facilities and treasure to that particular effort they believe desirable or necessary. To enter a "race" against an adversary under such conditions and to state that no additional taxes are necessary - indeed to suggest tax reductions - does not seem to me to be facing facts nor to be completely frank about the on-going program. . . . There can be only one real reason for such a "race". That reason must be "prestige". The present program without such a "race" but with full intention of accomplishing whatever needs to be accomplished in lunar and planetary exploration, unmanned and/or manned, is a vigorous and costly one. It will produce most of the significance technology and essentially all of the scientific knowledge that will be produced under the impetus of the "race" and at the lower cost in men and money. . . . Since the early 1970s Glennan has been involved in a variety of public service and civic activities. As of this writing (May 1993) he is 87 years old but still available to lend advice and support on a broad front to those who ask. He presently lives in Mitchellville, Maryland. 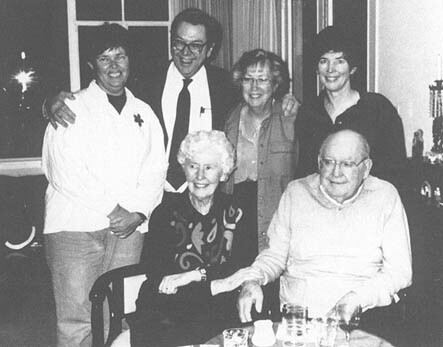 The Glennans and their children in late 1992. Standing behind Dr. and Mrs. Glennan from left to right are Pauline (Polly) Watts, an educator who, at the time the photo was taken, lived in the Virgin islands with her lawyer husband; Thomas K. Glennan, Jr. who lived m Mc Lean Virginia, with his wife Martha and was an economist with the Rand Corporation; Catherine (Kitty) Borchert who was an ordained Presbyterian minister living in Cleveland Ohio, with her husband Franck, a vice president for planning and budgets at Case Western Reserve University; and Sarah (Sally) Oldham who lived in McLean, Virginia, with her architect husband, Ted and was president of Scenic America a Washington-based, non-profit organization dedicated to the beautification of the nation's major highways. The document that follows was dictated by T. Keith Glennan to record for his own children his observations and priorities while head of NASA during the Eisenhower administration. The first part of it is actually a memoir, consisting of [xxxi] a summary of major events in which he participated during his early years at NASA in 1958 and 1959. Most of the rest is in a diary format, made up of daily summaries of events, including his personal reflections from 1 January 1960 through the end of the Eisenhower presidency over a year later. There also follows a postscript written by Glennan in 1963 to record his thoughts on the space program during the presidency of John F. Kennedy. The actual document was assembled by Glennan in the early 1960s, after his return to Case, typed up, and then bound in two volumes in 1964. He made copies of the diary for each of his children, kept one for himself, and placed one (restricted for a time) at the Eisenhower Presidential Library for research purposes. Later he made a copy available to the NASA History Division for incorporation into its reference collection. For many years historians have recognized the importance of this diary in charting the early history of NASA and the U.S. space program. It has been studied by historians and quoted at length in several historical texts, but until now the diary itself has been accessible to only a few people who could travel to Abilene or Washington to use it. Since the diary was dictated into a tape recorder rather than written and was never prepared for formal publication, Dr. J. D. Hunley, who has done most of the editing for this version of the diary, has corrected spelling, punctuation, and grammar in some places, shortened many sentences without changing their sense or general flavor, and omitted certain sections of the diary that contained purely family-oriented comments not germane to understanding Glennan's role at NASA. Dr. Hunley took over the editing responsibilities when other demands of my job made it clear that I could not finish the project in a reasonable amount of time. I had done the preliminary editing on the first three chapters, but he has revised those and done all of the editing for the remaining chapters. In every case we have shown the results of the editing to the author before committing them to print. To a very real extent, therefore, this published version of Glennan's diary represents his statement. We have not changed any of the observations or conclusions he reached in the unpublished version, although Glennan suggested that perhaps some of them did not prove to be valid and that he might have changed his mind over the course of the last quarter century, especially in relation to some of his hard comments about individuals with whom he dealt. He agreed, however, that the diary accurately represents his position as it crystallized in the early 1960s and that in itself makes it an exceptionally valuable historical document. Throughout the document, footnotes provide background information about matters that Glennan brings up in the diary but does not elaborate upon. The notes also add supplemental information about budgetary data, organizational matters, and the like, as well as occasional identifications of individuals mentioned in the diary but not fully identified. Where it is brief enough, sometimes we have provided identifications in brackets right in the text of the diary, and brackets sometimes also indicate where material from the original diary has been deleted. This latter practice is a rare one, however, used only when needed for transition. We have deleted a great deal of personal material and shortened some sentences without specific indication of the omissions because otherwise, the text would have been [xxxii] littered with ellipses. At the end of the diary, a biographical appendix provides sketches of the lives of the major figures Glennan talks about. Throughout this project Keith and Ruth Glennan have been exceptionally supportive and helpful. Without their assistance the project could not have been completed. I also wish to acknowledge the help of R. Cargill Hall, who shared his wealth of knowledge about the space program of the Eisenhower administration; Lee D. Saegessor, who helped track down illustrations and sources for footnotes; Robert H. Ferrell, who generously read several chapters of the diary and offered us his excellent editorial advice; and J.D. Hunley, who besides doing most of the editing, read and edited various drafts of this introduction, and provided valuable advice. In addition to these individuals, I wish to acknowledge and thank the following people who aided us in a variety of ways to complete this editorial assignment: Donald R. Baucom, Virginia P. Dawson, Andrew J. Dunar, Aaron K. Gillette, Michael R. Gorn, Adam L. Gruen, Richard P. Hallion, Mark Hayes, Marianne Hosea, H. C. Hunley, Sylvia K. Kraemer, Theresa Kraus, Beverley Lehrer, Cathleen S. Lewis, John L. Loos, Howard E. McCurdy, F. Mark McKiernan, Jerry Meyer, H. C. Erik Midelfort, Jeffrey Michaels, Jennifer Mitchum, John E. Naugle, Allan L. Needell, Michael J. Neufeld, Stephanie Pair, Tricia Porth, John L. Sloop, Joseph N. Tatarewicz, Joyce Thompson-Stipe, Dennis Vetock, William C. Walter, Mary Weyant, and Bruce Wolf. My thanks also go to Ellwood Anaheim and Ray Falvo for their persistence in preparing this manuscript for publication. Finally, I extend my thanks to the people at NASA's Printing and Graphics office, especially Kathy Jackson who served as copy editor and Frank Stewart who cropped and sized the photos, for their help in bookmaking. Needless to say, since we have not always followed all of the advice these people have kindly offered, Dr. Hunley and I retain responsibility for any errors in the book. T. Keith Glennan was responsible, probably more than any other single person in the early history of the agency, for creating a National Aeronautics and Space Administration that could carry out a broad-based scientific and technological program. As such, he left an enduring legacy to the agency. His personality and beliefs, fiscally and socially conservative in some ways but progressive in others, also helped to shape NASA. His diary leaves a valuable legacy to historians, scientists, engineers, and public policy analysts seeking to understand the evolution of the U.S. venture into space. Glennan left a remarkable account of his work at NASA, and his record of meetings with President Eisenhower, the National Security Council, and other bodies as well as of the evolution of NASA as an institution provides important perspectives not only for those specifically interested in NASA but also for students of the recent history of science and technology in the United States. 1. On the success of Glennan's presidency at Case Institute of Technology see C.H. Cramer, Case Institute of Technology: A Centennial History, 1880-1980 (Cleveland: Case Western Reserve University, 1980), pp. 171-208. 2. On NASA's creation and early years see, Robert L. Rosholt, An Administrative History of NASA, 1958-1963 (Washington, D.C.: National Aeronautics and Space Administration SP-4101, 1966); Enid Curtis Bok Schoettle, "The Establishment of NASA," in Sanford A. Lakoff, ed., Knowledge and Power (New York: The Free Press, 1966), pp. 162-270; Rip Bulkeley, The Sputniks Crisis and Early United States Space Policy: A Critique of the Historiography of Space (Bloomington: Indiana University Press, 1991). 3. The standard work on how international rivalries between the United States and the Soviet Union were played out in the two nations' space program is Walter A. McDougall, . . . The Heavens and the Earth: A Political History of the Space Age (New York: Basic Books, 1985). 4. "Interview Highlights on T. Keith Glennan," 21 June 1947, Biographical Files, Collection 7PI, University Archives, Case Western Reserve University, Cleveland, and T. Keith Glennan to Roger D. Launius, Chief, NASA History Office, 8 May 1993. 5. G. Edward White has described the formation of an eastern establishment in the late nineteenth century as a male order in which the progression from brahmin stock, to prep school, to Ivy League college, to men's clubs played a central role in defining an elite core of American leaders. While Glennan entered this world only at the Ivy League college level, his capabilities helped him to maintain and flourish as part of this establishment. See G. Edward White, The Eastern Establishment and the Western Experience: The West of Frederic Remington, Theodore Roosevelt, and Owen Wister (New Haven: Yale University Press, 1968), pp. 11-30. 6. "Interview Highlights on T. Keith Glennan," 21 June 1947, Biographical Files, Collection 7PI; letter cited above in note 4. 7. The predecessor of this organization had been established as the National Research Advisory Committee on 27 June 1940, following a conversation between Vannevar Bush and one of Roosevelt's key advisors, Harry Hopkins, over concerns the scientists had about the nation's lack of preparedness for war. In that meeting, Bush offered to take charge of an effort to organize scientific activities for victory. He was motivated to this end, he recalled, by "the threat of a possible atomic bomb [that] was in all our minds, and time might well determine whether it became ours or a means for our enslavement" (Vannevar Bush, Pieces of the Action [New York: William Morrow and Co., 1970], p. 34). 8. The history of this organization is documented in James Phinney Baxter III, Scientists Against Time (Boston: Atlantic-Little, Brown, 1946). On earlier scientific activities in the Federal Government see, A. Hunter Dupree, Science in the Federal Government: A History of Policies and Activities to 1940 (Cambridge, Massachusetts: Harvard University Press, 1957). 9. Glennan's commitment to public service was consistent throughout his career. When he was serving as a commissioner for the Atomic Energy Commission in he early 1950s, one of his friends wrote to ask if there was a way he could help his son avoid the draft (Ed Frawley to T. Keith Glennan, 18 January 1951, Glennan Personal Papers, 19DD4, Case Western Reserve University Archives, Cleveland, OH). Glennan responded that he was not inclined to use his public position to influence such matters, but added, "frankly, I think the best thing to do is to let him take his chance with the Selective Service or whatever else is decreed as the normal course for all young men. It is my opinion that all of these youngsters are going to have to give some of their time to government service whether it be in the armed forces or in some other field." Such service should not be considered onerous, but was a responsibility all should be pleased to bear (T. Keith Glennan to Ed Frawley, 23 January 1951, Glennan Personal Papers, 19DD4). 10. See Susan Curtis, A Consuming Faith: The Social Gospel and Modern American Culture (Baltimore, MD: Johns Hopkins University Press, 1991), pp. 270-85; Wayne K. Hobson, "Professionals, Progressives and Bureaucratization: A Reassessment," The Historian, 39 (August 1977): 639-58; Brian Balogh, "Reorganizing the Organizational Synthesis: Federal-Professional Relations in Modern America," Studies in American Political Development, 5 (Spring 1991): 119-72. 11. Vannevar Bush, Director, Office of Scientific Research and Development, to T. Keith Glennan, 27 October 1942, 4 December 1943; T. Keith Glennan to Fern Sullivan, Office of Scientific Research and Development, 22 November 1944, all in President's Files, Collection 19DB4, Case Western Reserve University Archives. 12. "Interview Highlights on T. Keith Glennan," 21 June 1947, Biographical Files, Collection 7PI; telephonic interview of T. Keith Glennan by J. D. Hunley, 8 July 1993. 13. Interview of T. Keith Glennan by Ruth W. Helmuth, 19 April 1976, President's Collection, 19DB4, Case Western Reserve University Archives, Cleveland. 14. Ibid. ; T. Keith Glennan to Charles Boren, 24 January 1948, T. Keith Glennan Personal Papers, 19DD4; T. Keith Glennan to J. D. Hunley, 28 June 1993. 15. Interview of T. Keith Glennan by Ruth W. Helmuth, 19 April 1976, President's Collection, 19DB4. 16. T. Keith Glennan to William E. Barbour, Jr., President, Tracerlab, Inc., 3 March 1952, Glennan Personal Papers, 19DD4; Cramer, Case Institute of Technology, pp. 171-200; "He Did It All," CWRU Magazine, February 1990, pp. 9-15; T. Keith Glennan to J. D. Hunley, 27 June 1993. 17. T. Keith Glennan to Rufus Day, Jr., McAfee, Grossman, et al., 16 January 1951, Glennan Personal Papers, 19DD4. 18. "Nurturing Paternalism," Huntington (WV) Advertiser, 23 March 1950. 19. Glennan to Barbour, 3 March 1952, Glennan Personal Papers, 19DD4. 20. J.M. Telleen to T. Keith Glennan, 15 November 1956; T. Keith Glennan to J.M. Telleen, 19 November 1956, both in Glennan Personal Papers, 19DD4. 21. Richard G. Hewlett and Francis Duncan, Atomic Shield, 1947-1952: Volume II, A History of the United States Atomic Energy Commission (University Park: Pennsylvania State University Press, 1969), p. 468. 22. "He Did It all," CWRU Magazine, February 1990, p. 12. 23. Joint Committee on Atomic Energy, Hearing on Confirmation of Thomas Keith Glennan To Be a Member of the Atomic Energy Commission, August 16, 1950 (Washington, D.C.: Government Printing Office, 1950); Albert L. Baker, President, Kellex Corp., to T. Keith Glennan, 2 November 1950, Glennan Personal Papers, 19DD4; "He Did It All," CWRU Magazine, February 1990, p. 13; Hewlett and Duncan, Atomic Shield, pp. 542-45. 24. Interview of T. Keith Glennan by Ruth W. Helmuth, 19 April 1976, President's Files, Collection 19DB4; Cramer, Case Institute of Technology, pp. 200-202. 25. Walter Hamilton, Secretary to the Panel, of Congress' Joint Committee on Atomic Energy, to T. Keith Glennan, 30 June 1955; T. Keith Glennan to Walter Hamilton, 1 June 1955; T. Keith Glennan to Senator Clinton P. Anderson, 9 February 1956, all in Glennan Personal Papers, 19DD4. 26. T. Keith Glennan to Lewis L. Strauss, 21 January 1957, 25 February 1957; Lewis L. Strauss to T. Keith Glennan, 15 February 1957, with enclosure; all in Glennan Personal Papers, 19DD4. 27. Report On Higher Education in the Soviet Union (Pittsburgh: University of Pittsburgh Press, 1958); Alan T. Waterman, Director of National Science Foundation, to T. Keith Glennan, 11 July 1958, President's Collection, DB14; Glennan to Launius, 8 May 1993. 28. This proved incorrect, however, and Fred I. Greenstein demonstrated the fact in The Hidden-Hand Presidency: Eisenhower as Leader (New York: Basic Books, 1982). He argued that Eisenhower worked behind the scenes while giving the appearance of inaction, and in most instances his indirect approach to leadership was highly effective. This has been extended to Eisenhower's space program in R. Cargill Hall, "Eisenhower, Open Skies, and Freedom of Space," IAA-92-0184, paper delivered on 2 September 1992 to the International Astronautical Federation, Washington, D.C.
29. G. Mennen Williams, quoted in William E. Burrows, Deep Black: Space Espionage and National Security (New York: Random House, 1987), pp. 94-94. See also Derek W. Elliott, "Finding an Appropriate Commitment: Space Policy Under Eisenhower and Kennedy," Ph.D. Diss., George Washington University, 1992. 30. Speeches of Lyndon B. Johnson, Tyler, TX, 18 October 1957, and Austin, TX, 19 October 1957, both in Statements file, Box 22, Lyndon B. Johnson Presidential Library, Austin, TX. On the preparedness subcommittee, see McDougall, Heavens and the Earth, pp. 142, 151-155, 162, 166, 214, 387; Robert Dallek, Lone Star Rising: Lyndon Johnson and His Times, 1908-1960 (Oxford: Oxford University Press, 1991), pp. 529-531. 31. Alison Griffith, The National Aeronautics and Space Act: A Study of the Development of Public Policy (Washington, D.C.: Public Affairs Press, 1962), pp. 19-24. 32. Rosholt, Administrative History of NASA, pp. 8-12. On the history of the NACA see, Alex Roland, Model Research: The National Advisory Committee for Aeronautics, 1915-1958 2 vols. (Washington, D.C.: National Aeronautics and Space Administration, NASA SP-4103, 1985). 33. "National Aeronautics and Space Act," Hearings before the Senate Committee on Space and Astronautics, 85th Cong., 2d Sess. (Washington, D.C.: Government Printing Office, 1958), pp. 91, 258; Griffith, National Aeronautics and Space Act, p. 93; Rosholt, Administrative History of NASA, pp. 10-17; U.S. Congress, House, Select Committee on Astronautics and Space Exploration, Astronautics and Space Exploration, Hearings on H.R. 11881, 85th Cong., 2d. Sess. (Washington, D.C.: Government Printing Office, 1958), pp. 3-5, 11-15, 967-69; Schoettle, "Establishment of NASA," pp. 229-39; "Analysis of S.3609 with Proposed Modifications," 8 May 1958; Senate Special Committee Memo, 11 April 1958, both in Richard B. Russell Papers, ser. 9, A, box 3, Johnson Library; Lyndon B. Johnson, The Vantage Point: Perspectives of the Presidency, 1963-1969 (New York: Holt, Rinehart & Winston, 1971), p. 277; James R. Killian, Jr., Sputnik, Scientists, and Eisenhower: A Memoir of the First Special Assistant to the President for Science and Technology (Cambridge, MA: MIT Press, 1977), pp. 137-38. 34. On the "leapfrog" concept see, U.S. Congress, House Select Committee on Astronautics and Space Exploration, Establishment of the National Space Program, H. Rprt. 1770 on H.R. 12575, 85th Cong., 2d Sess. (Washington, D.C.: Government Printing Office, 1958), p. 4. U.S. Congress, House Select Committee on Astronautics and Space Exploration, Authorizing Construction for the National Aeronautics and Space Administration, Hearings on H.R. 13619, 85th Cong., 2d. Sess. (Washington, D.C.: Government Printing Office, 1958), pp. 9, 12; New York Times, 6 August 1958; Washington Post, 9 August 1958. 35. Rosholt, Administrative History of NASA, pp. 40-42; "He Did It All," CRWU Magazine, February 1990, p. 13; McDougall, Heavens and the Earth, p. 196; Senate Special Committee on Space and Astronautics, Hearing on Nomination of T. Keith Glennan To Be Administrator, National Aeronautics and Space Administration and the Nomination of Dr. Hugh L. Dryden to Be Deputy Administrator, National Aeronautics and Space Administration, August 14, 1958 (Washington, D.C.: Government Printing Office, 1958); Washington Post, 9 August 1958, 11 August 1958; Killian, Sputnik, Scientists, and Eisenhower, pp. 138-40. 36. These themes are well developed in T. Keith Glennan's diary that follows. See also, "Glennan Announces First Details of the New Space Agency Organization," 5 October 1958, NASA Historical Reference Collection, NASA History Office, National Aeronautics and Space Administration, Washington, D.C.; Killian, Sputnik, Scientists, and Eisenhower, pp. 141-44; James R. Killian, Jr., Oral History, 23 July 1974, NASA Historical Reference Collection. Eisenhower's concerns about this aspect of modern America are revealed in "Farewell Radio and Television Address to the American People," 17 January 1961, Papers of the President, Dwight D. Eisenhower 1960-61 (Washington, D.C.: Government Printing Office, 1961), pp. 1035-40. 37. On these institutions see, Roland, Model Research, I:283-303; James R. Hansen, Engineer in Charge: A History of the Langley Aeronautical Laboratory, 1917-1958 (Washington, D.C.: NASA SP-4305, 1987); Elizabeth A. Muenger, Searching the Horizon: A History of Ames Research Center, 1940-1976 (Washington, D.C.: NASA SP-4304, 1985); Virginia P. Dawson, Engines and Innovation: Lewis Laboratory and American Propulsion Technology (Washington, D.C.: NASA SP-4306, 1991); Richard P. Hallion, On the Frontier: Flight Research at Dryden, 1946-1981 (Washington, D.C.: NASA SP-4305, 1984); Joseph Adams Shortal, A New Dimension: Wallops Island Flight Test Range: The First Fifteen Years (Washington, D.C.: NASA Reference Publication 1028, 1978). On the technical culture of the NACA see, Howard E. McCurdy, The Two NASAs: High Technology and Organizational Change in the U.S. Space Program (Baltimore, MD: Johns Hopkins University Press, 1993); Nancy Jane Petrovic, "Design for Decline: Executive Management and the Eclipse of NASA," Ph.D. Diss., University of Maryland, 1982. 38. The transfer of several DOD programs to NASA was ordered in William J. Hopkins, White House Executive Clerk to T. Keith Glennan, 2 October 1958, w/enclosures, NASA Historical Reference Collection. On Goddard's creation see, Alfred Rosenthal, Venture into Space: Early Years of Goddard Space Flight Center (Washington, D.C.: NASA SP-4301, 1968). 39. On JPL's history see also Clayton R. Koppes, JPL and the American Space Program: A History of the Jet Propulsion Laboratory (New Haven: Yale University Press, 1982). 40. See McCurdy, Inside NASA, esp. pp. 16, 36; U.S. Senate Committee on Aeronautical and Space Sciences, NASA Authorization Subcommittee, 86th Cong., 2d Sess., Transfer of Von Braun Team to NASA (Washington, D.C.: Government Printing Office, 1960); Rosholt, Administrative History of NASA, pp. 46-47, 117-20. 41. On the creation of the Houston center see Henry C. Dethloff, "Suddenly Tomorrow Came . . .": A History of the Johnson Space Center (Washington, D.C.: NASA SP-4307, 1993). On the Kennedy Space Center see, Charles D. Benson and William Barnaby Faherty, Moonport: A History of Apollo Launch Facilities and Operations (Washington, D.C.: NASA SP-4204, 1978). 42. "Glennan Looks to Moon, But With Purpose in Mind," Times Herald, 4 February 1960. See also "Space Death Wouldn't Halt U.S. Effort, Glennan Says," Baltimore Sun, 11 April 1960; "Glennan Has Goal in Space," New York World Telegram, 5 February 1960; "Capital Circus," New York Times, 30 December 1959. 43. "He Did It All," CWRU Magazine, February 1990, p. 14. 44. T. Keith Glennan to James R. Killian, Jr., 27 May 1959, NASA Historical Reference Collection; McDougall, Heavens and the Earth, p. 202. 45. T. Keith Glennan to President Dwight D. Eisenhower, 28 December 1960; President Dwight D. Eisenhower to T. Keith Glennan, 29 December 1960, both in NASA Historical Reference Collection; "NASA Post is Resigned by Glennan," Baltimore Sun, 30 December 1960. 46. This story is told in Gordan A. Craig, The Politics of the Prussian Army, 1640-1945 (New York: Oxford University Press, 1955), pp. 11-14; Sidney B. Fay, The Rise of Brandenburg-Prussia to 1786, revised by Klaus Epstein (New York: Holt, Rinehart and Winston, Inc., 1964), pp. 101-111; and E. J. Feuchtwanger, Prussia, Myth and Reality: The Role of Prussia in German History (Chicago: Henry Regnery Company, 1970), pp. 52-73. 47. T. Keith Glennan to Robert Gilruth, 16 April 1961, Glennan Personal Papers, 19DD4. 48. U.S. Congress, Senate Committee on Aeronautical and Space Sciences, Documents on International Aspects of the Exploration and Uses of Outer Space, 1954-1962, 88th Cong., 1st Sess., 1963, Senate Document 18, pp. 202-204; Public Papers of the Presidents of the United States: John F. Kennedy . . ., 1961 (Washington, D.C.: Government Printing Office, 1962), pp. 396-406, quotation from p. 404. The standard work on this decision, while more than twenty years old, remains John M. Logsdon, The Decision to Go to the Moon: Project Apollo and the National Interest (Cambridge, MA: MIT Press, 1970). 49. Richard E. Horner, Northrop Corp., to T. Keith Glennan, 1 June 1961; T. Keith Glennan to J.B. Lawrence Chair, International Fact Finding Inst., 16 May 1961; T. Keith Glennan to Richard M. Nixon, 14 June 1961; T. Keith Glennan to Dwight D. Eisenhower, 14 June 1961, 13 November 1961; T. Keith Glennan to George Kistiakowsky, 4 December 1961; T. Keith Glennan to James R. Killian, Jr., 4 December 1961; James R. Killian to T. Keith Glennan, 19 December 1961; T. Keith Glennan to Neil McElroy, 22 September 1961, all in Glennan Personal Papers, 19DD4. 50. T. Keith Glennan to Dwight D. Eisenhower, 31 May 1961, Glennan Personal Papers, 19DD4. 51. T. Keith Glennan to James E. Webb, 21 July 1961, Glennan Personal Papers, 19DD4. 52. T. Keith Glennan to James E. Webb, 6 November 1962; T. Keith Glennan to Hugh Dryden, 20 November 1964; T. Keith Glennan to M.S. Rowan, Rand Corp., 26 March 1968; T. Keith Glennan to Richard E. Horner, Senior Vice President, Northrop Corp., 3 June 1968; all in Glennan Personal Papers, 19DD4. 53. "Case-WRU Joint Calendar Committee," 4 January 1960-1967; "Appointment of Presidential Committee on Plans, Programs and Resources," 1 May 1964; "Joint Statement of Dr. T. Keith Glennan and Dr. John R. Millis," 1 November 1965; "Resolution Adopted by the Board of Trustees of Western Reserve University," 8 September 1966; Henry F. Heald, et al., "Second interim Report of the Case-W.R.U. Study Commission," 22 November 1966; "Resolution on Federation," 10 January 1967, all in Case Central Files, 19DC, Case Western Reserve University Archives; Ruth Fischer, "Case Western Reserve: Federation Fever," Change: The Magazine of Learning, 10 (October 1978): 38-43; Lawrence S. Finkelstein, "Case-WRU Study Commission at Work," Western Reserve University Outlook, 4 (Winter 1967): 3-5. 54. T. Keith Glennan to Thomas P. Murtaugh, 16 March 1962, Glennan Personal Papers, 19DD4; "Glennans Cherish 18 Years Here," Cleveland Plain Dealer, 27 March 1965; T. Keith Glennan to Dr. Raymond L. Bisplinghoff, Alexandria, Virginia, 24 June 1965; Case Institute of Technology Faculty Announcement, 25 June 1965; Elmer L. Lindseth, Chair, Board of Trustees, to Willia C. Treuhaft, 13 August 1965; "Action of Trustees Without a Meeting," 20 August 1965, all in Central Files, 19DC. 55. T. Keith Glennan to Harry S. Rowen, Rand Corporation, 21 August 1967; T. Keith Glennan to Lewis L. Strauss, 1 October 1968; T. Keith Glennan to Franklin A. Long, Cornell University, 25 January 1968; T. Keith Glennan to Cong. Emilio Q. Daddario, 24 July 1967; T. Keith Glennan to James R. Schlesinger, 1 May 1968; T. Keith Glennan to Kingman Brewster, President, Yale University, 16 Oct 1968, all in Glennan Personal Papers, 19DD4. 56. T. Keith Glennan to Polycarp Kusch, Department of Physics, Columbia University, 13 May 1968, Glennan Personal Papers, 19DD4. 57. Polycarp Kusch to T. Keith Glennan, 17 May 1968, Glennan Personal Papers, 19DD4. 58. T. Keith Glennan to Polycarp Kusch, 23 May 1968, Glennan Personal Papers, 19DD4. For a discussion of this transformation see, Allen J. Matusow, The Unraveling of America: A History of Liberalism in the 1960s (New York: Harper & Row, 1984).